DynoTune Product, 112.2-2-2.5LB Billet Bottle Bracket - DynoTune, Nitrous systems, Purge kits, Nitrous Bottle heaters and more! 2-2.5LB Billet Bottle Bracket, machined finish. Use some mothers polish and it will shine like chrome! Fits 2LB to 2.5LB nitrous and co2 bottles. Bottles with 4.25" Diameter. Hole spacing is standard 2.5" so it will fit many extended swingarms. Add the optional bracket base if you want to mount it to a flat part on the swingarm, drill and bolt in place! Comes with stainless hardware 1/4-20 bolts. 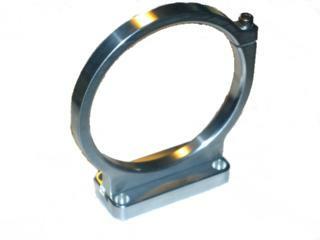 Optional bracket base 3.6" x 1.6" x .5"